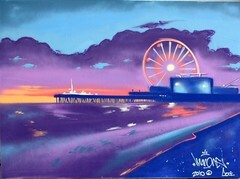 I was hired to paint at a Yelp Elite event in Santa Monica last week. I busted a quick aerosol piece with a S.M. Pier seascape. If interested the canvas is available and for sale.